Parents: Read BEFORE your next Family Dinner. 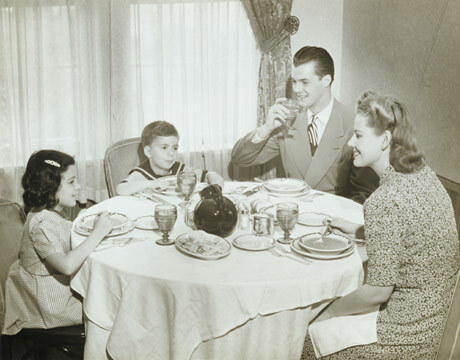 As all parents of young children, my Wife and I look forward to the possibility of sitting down to a dinner free from yelling or fighting, or falling off chairs, or crying about food they don’t like, or allowing noises to escape their little bodies at inappropriate times. This hope begins every night at our house…. with a prayer…. It’s quiet, almost peaceful around the table as our 3-year-old settles in…. hands together, eyes closed, preparing her thoughts internally before she voices her prayer. I open my eyes to watch her and I am immediately drawn to our 5-year-old watching the food on her plate. Her finger heads toward the mashed potatoes. I open my eyes wide in her direction. Our 5-year-old inserts her finger into the potatoes and licks them clean. I point my eyebrows at her and mouth the word, “STOP”. She puts her hands back in her lap. Our 7-year-old, eyes squinting in prayer, grabs his cup for a quick drink. I grab his hand and motion for him to set it down. In the meantime the 5-year-old bows her head…. and starts sucking up grapes from her plate. I snap my finger at her and she looks up at me, cheeks bulging. By now the 3-year-old, growing tired of her own prayer, has picked up a green bean, and continues to pray as she chews. My wife stops her in the middle of her snack break and asks her to finish the prayer. “Help Adeline and Evan to be nice to each other”…. I hear tapping…. why is there tapping??? The 7-year-old is now unconsciously playing drums with his spoon. Seeing I am distracted, the 5-year-old reaches for her milk, only to be blocked by my wife. For a moment, a holy hush descends on the table. My wife looks at me, I grin at her as tears well up in her eyes. At the same moment, a cartoon-like noise escapes the body of one of the children on my left. Everyone looks up like a startled brood of chickens. The 7 and 5 year olds smile and start to laugh. Penny gives them each a look and they hold their cheeks down, as if that will stop the inevitable. The 7-year-old, locked in a silent but violent laugh, slips off his chair and on to the floor. The 5-year-old, spits milk out of her mouth and joins her brother under the table. Penny looks over at me, our eyes meet, and I burst into laughter. My Wife now stares at me with wide eyes, fighting back the smile that is overpowering her face. We shake our heads and close our eyes. We didn’t want to laugh. In the moment we felt like struggling parents losing another battle to make our kids a little more “Von-Trapp”- like. But we laughed, because as much as we love discipline at the table, we could not fight the infectious laughter of three children living through this learning process with all the joy, craziness, and bodily noises they had in them. In some strange way, there was something sacred about that night with our three kids. Sacred in a way that made us stop and mentally record such moments, before we come back to the table one day and find well-behaved young adults in their place.